For the past few years, our family has spent spring break in Maui, but with the increasing number of Asian carriers landing at North American airports, especially those from mainland China, airfares to Asia have been too good to pass up. That’s why we decided to fly from Vancouver (YVR) to Bangkok (BKK), and spend two weeks in Thailand, instead. Vancouver has long been Canada’s gateway to Asia. In fact, from many U.S. cities, it’s often quicker to route through Vancouver when traveling to eastern Asia. 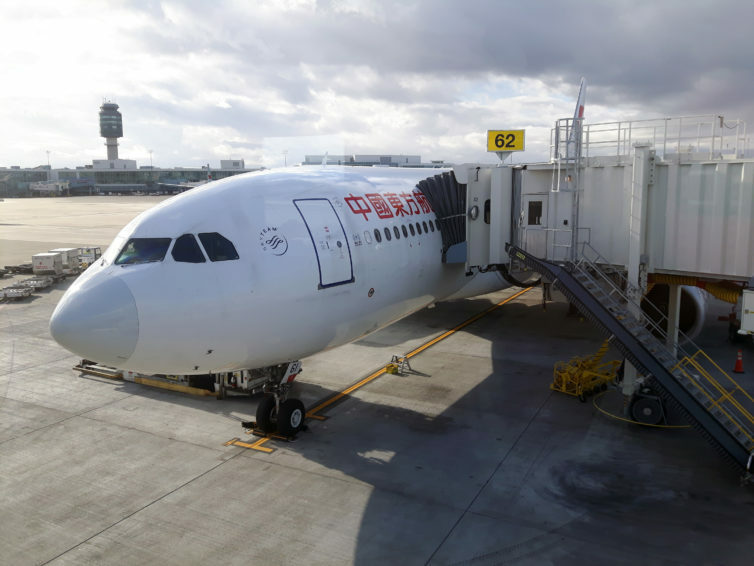 Fifteen Asian carriers currently serve Vancouver; seven of those are from mainland China, including Hainan Airlines which joined the list in May, with a twice-weekly service connecting the western Canadian city with Shenzhen and Tianjin. 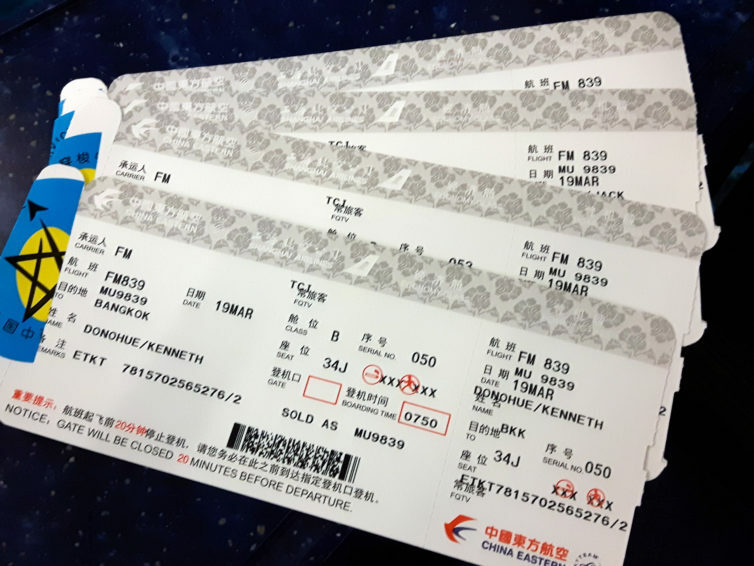 We booked with China Eastern, as they had a great deal of $730 CDN ($570USD) all-in to Bangkok. The airline first started service to Vancouver in 2004, and now has 14 flights a week to YVR. I had never flown the Shanghai-based carrier before, and looking at the online reviews, their service is decidedly mixed. Some of the reviews went like this: “what a nightmare experience”, “never recommend this airline”, “service is awful and messy”, “worst airline”. To be fair, there were an equal number of positive comments, but I even noticed that social media comments on the airline made the overly anxious reach for the refund policy when they read negative comments. A day before our trip, I caught my wife looking up reviews of the airline. “What kind of airline is this,” she asked? “Just go with no expectations, then you might be surprised,” I told her. “Well, I do have an expectation now, and it doesn’t seem good,” she replied. China Eastern operates two flights a day from Vancouver; one that departs just after noon, and the other after midnight. The latter is timed for morning connections at their Shanghai hub. Our outbound flight to Bangkok departed at 01:30. I tried to check-in online, but the airline’s website was clunky, and the web check-in didn’t work. Was this a sign of things to come? YVR was busy at this time of night. In addition to our flight, there were two flights departing to Australia, two to Taipei, one to Hong Kong, and another to Mexico City. Despite the number of long-haul flights, check-in and security screening was quick. 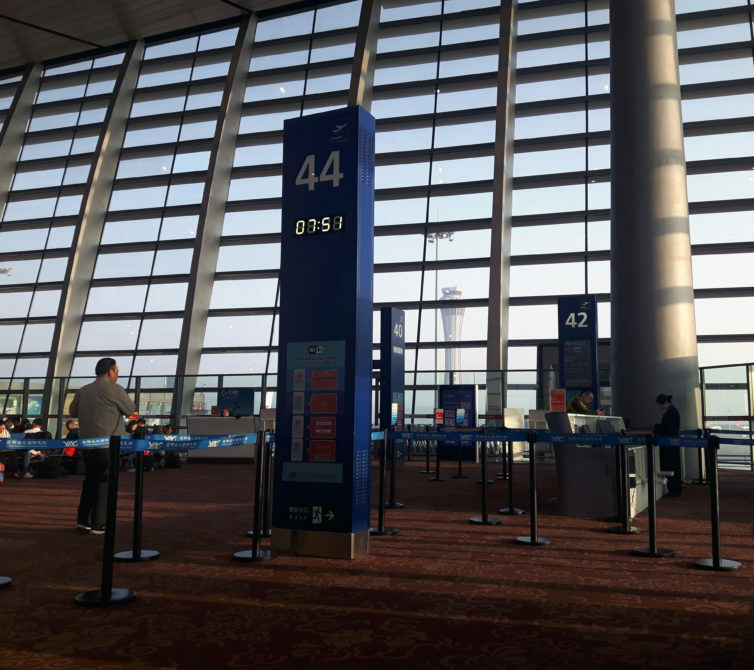 Having arrived in the early evening, our aircraft was already waiting at Gate D64. Despite staff announcing boarding by row numbers, a mass of people crowded around the gate. Thankfully, the staff were diligent about turning back passengers whose rows hadn’t been called. 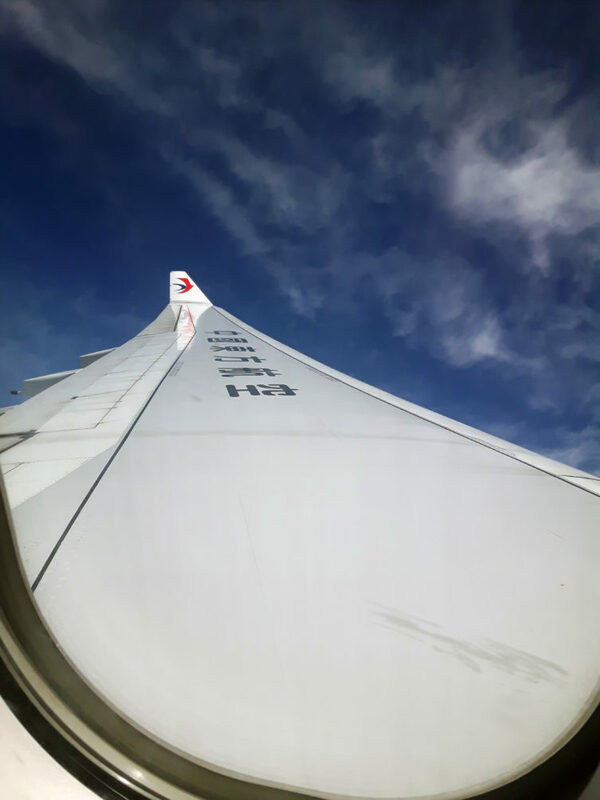 We boarded the Airbus A330, and settled into rows 69 and 70, near the rear of the aircraft. When I spotted the personal seat-back monitors, I thought perhaps this flight wouldn’t be so bad after all. With an announced flying time of 11 hours and 40 minutes, we pushed back 15 minutes early at 01:15, and a short time later rotated off runway 26L. Soon after takeoff, a meal service commenced, with two choices between beef and noodles or chicken and rice. I chose the chicken, which had a pleasing taste. Instead of having one drink and food cart for each aisle of the economy cabin, as many airlines do, they served each section at the same time. This was a refreshing, as those of us in the rear of the aircraft didn’t have to wait as long for the meal. I used to think that one thing that distinguished business class from economy was that you got a heated bun up front, where in the back it was cold. Apart from some of the world’s leading airlines, this is usually the case. I was surprised that during the meal service, cabin attendants came around with a basket of warm buns. A nice touch, though I did notice on some flights, the buns were distributed after most people had finished their meal, which wasn’t the best timing. 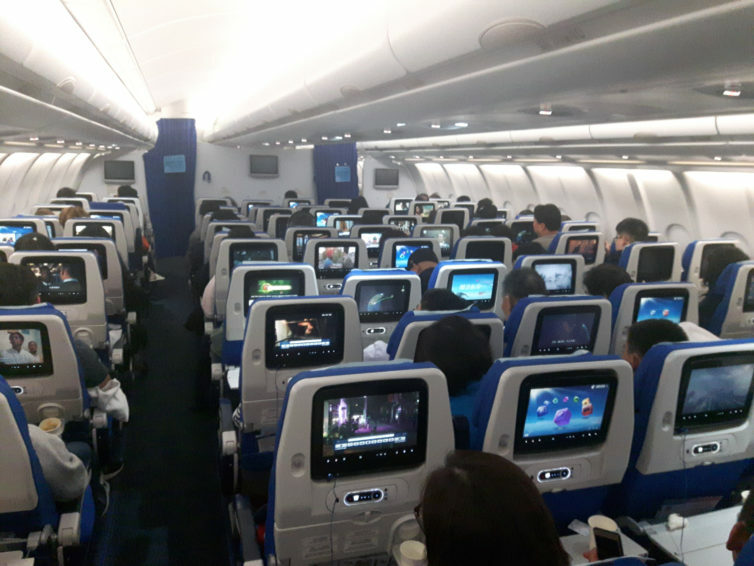 I’m not much of a movie person, but I did note that the inflight entertainment system had an extensive selection of 54 Hollywood movies, and other Chinese and international films. At 05:00 local time, we touched down at Shanghai’s Pudong Airport. Being one of the first flights to arrive in the morning, the airport was quiet. With our checked baggage tagged through to BKK, we whiled away the time in the departure lounge. 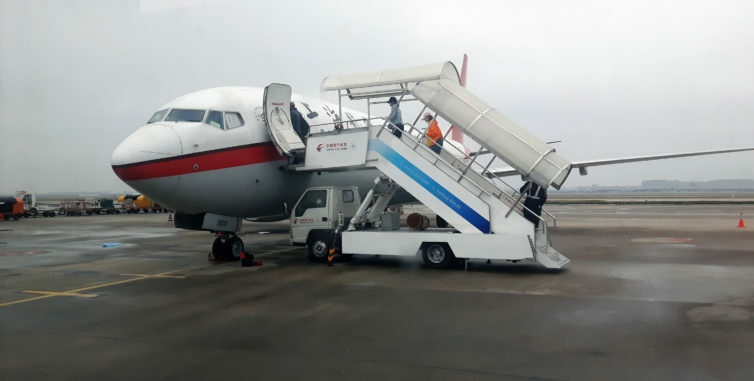 Three hours after arriving at Shanghai, we were bussed to a remote stand, where we boarded a Shanghai Airlines Boeing 737. Shanghai Airlines is a wholly-owned subsidiary of China Eastern. It was surprisingly cold and blustery as we climbed the stairs of the aircraft. But the warmth of Thailand was just hours away. We took off from runway 35R, and with a flight time of four hours, we tracked south across China, Vietnam, and Laos, before crossing into Thai airspace. Pillows and blankets were offered, along with a hot meal service, something which has become a thing of the past in some parts of the world. 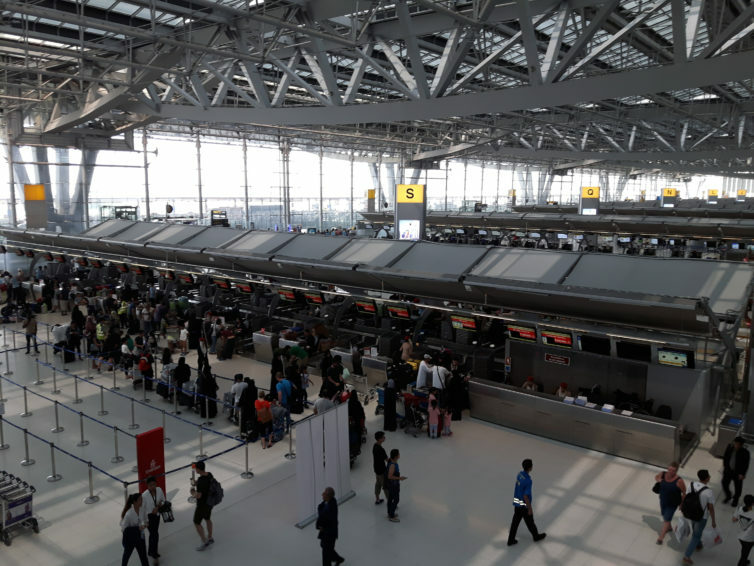 Under sunny skies, and with temperatures in the mid-30s (95 degrees Fahrenheit), we touched down at Bangkok’s Suvarnabhumi Airport just after noon, some 21 hours after leaving Vancouver. Our routing home would take us from Bangkok to Kunming, China for an overnight stop, before continuing to Vancouver, with a stop in Nanjing, 300 km west of Shanghai. While checking in for the flight, an airline agent, unprompted, printed off our onward itinerary, which we could show Chinese immigration to confirm we would be transiting through the country. 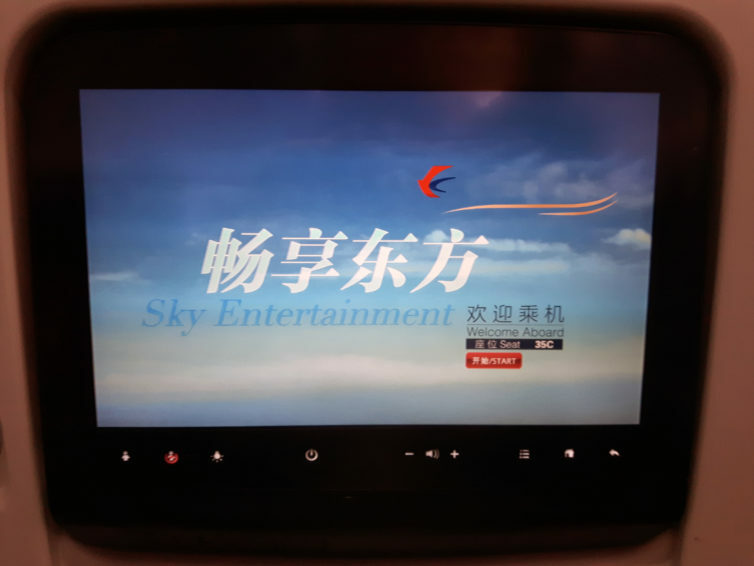 From Bangkok’s Suvarnabhumi Airport, a China Eastern Boeing 737-800, operating as flight MU742, took us two hours north to Kunming (KMG). As had become standard on our China Eastern flights, pillows and newspapers were distributed. We were seated in row 34, which on this aircraft was the fourth row in the economy cabin. We departed on time, and before long we left the Thai capital behind. With enough time for a full meal and drinks service, we began our descent into Kunming at 18:35, and 40 minutes later we were on the ground. Because our stay in China was less than 24 hours, we were exempt from having to obtain a visa (Editor’s Note: these China policies vary depending on your country of citizenship). 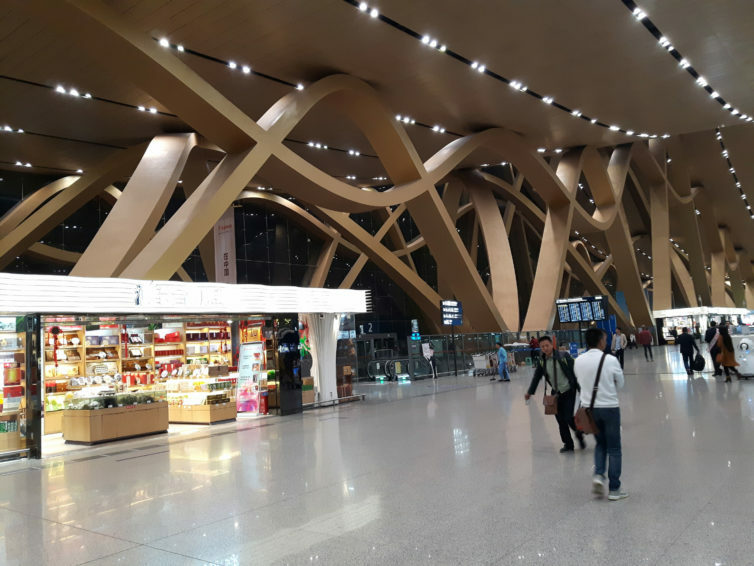 Early the following morning, we returned to Kunming’s Changshui International Airport for our direct flight (yes, a true “direct” flight) to Vancouver, via Nanjing (NKG). Opened in 2012, the airport is modern and has a very spacious feel. We checked the departures monitor and despite it saying that check-in for Vancouver was at counters H and J, there was just a single business class counter open, which caused some confusion for the handful of passengers like us wondering where to check in. After some time waiting for more counters to open, we ended up checking in at the business class desk. Our Airbus A330 left the gate on schedule at 08:40, and after taxiing to the runway, we had a 15-minute wait for takeoff clearance. Presumably, this was because of the busy morning rush. Most of the passengers on board were travelling to Nanjing, with only a few of us continuing to Vancouver. There was one meal service of beef and rice, and service from cabin attendants was mediocre. Compared to other flights experienced on this trip, the cabin crew spoke little English. 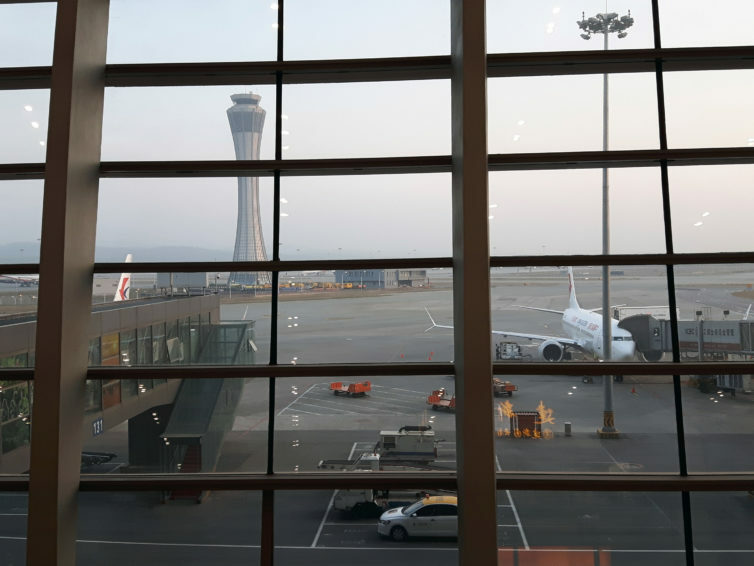 Some two hours after tracking across southern China, we landed at Nanjing’s Lantou Airport, where we were required to deplane and go through immigration and security. Fortunately, this was located near our gate, and it did not take long. There was a crew change for our onward flight across the Pacific, and with a full complement of passengers, we pushed back 10 minutes behind schedule. As on most of the previous flights, the service was good, and included two meal services and a mid-flight snack. During the 11-hour flight, cabin attendants came through several times offering green tea. The only complaint was an inoperable soap dispenser in the toilet. I noticed this on our first flight to Shanghai, but on that flight, they provided a bar of soap. Is China Eastern shaking its negative reputation? I’m not sure a handful of flights can adequately judge; however, if my experience counts for anything, then perhaps it is. 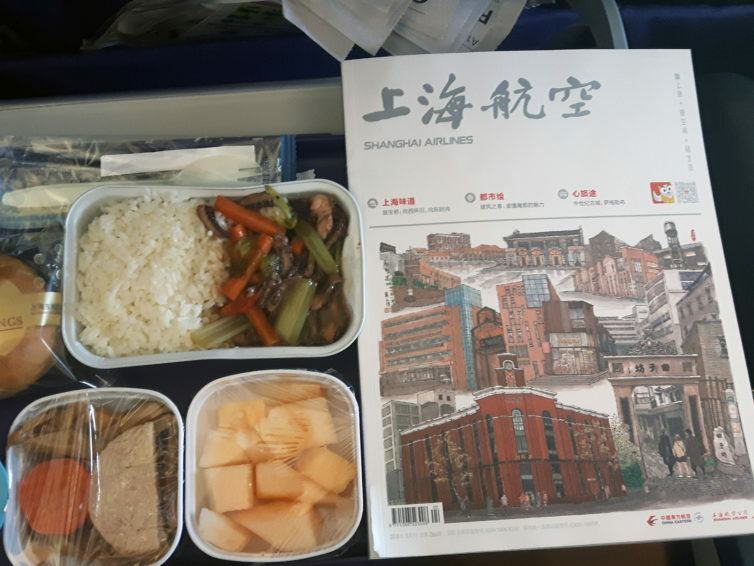 Did China Eastern exceed my expectations, because I had set the bar low? It’s a question I keep asking myself, but I don’t think so. As an aviation journalist, I have experienced dozens of airlines. I have seen what excellent service looks like, and I have experienced the mediocre. China Eastern provided good service. Given the negative reviews that have dogged the airline, its biggest failing is probably a lack of consistent service. I never thought I would end up saying this, but based on my experience I would recommend China Eastern. This story was written by Ken Donohue for AirlineReporter. Curious by nature, inspired by flight, fascinated by the places, people, and stories that make flying possible, Ken is based in Vancouver. You can see more of his work at www.kendonohue.com. The post China Eastern Economy: Does it Deliver? appeared first on AirlineReporter.